The sources of TeX Live binaries are now (hopefully) frozen, and barring unpleasant surprises, these will be code going into the final release (one fix for luatex is coming, though). 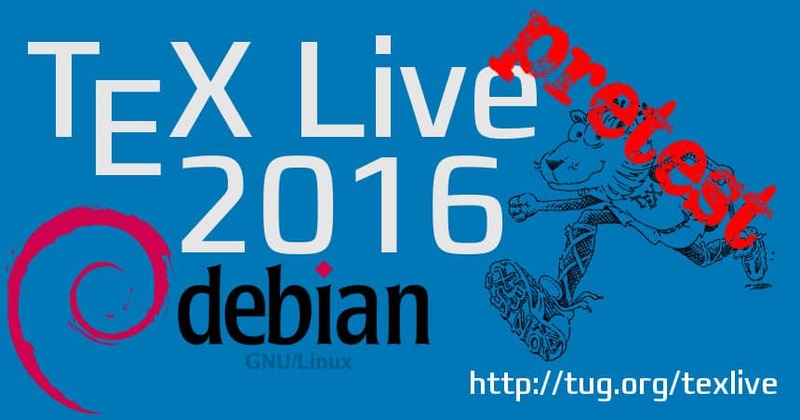 Thus, I thought it is time to upload TeX Live 2016 packages to Debian/unstable to expose them to a wider testing area – packages in experimental receive hardly any testing. The biggest changes are with Luatex, where APIs were changed fundamentally and practically each package using luatex specific code needs to be adjusted. Most of the package authors have already uploaded fixed versions to CTAN and thus to TeX Live, but some are surely still open. I have taken the step to provide driver files for pgf and pgfplots to support pgf with luatex (as I need it myself). One more thing to be mentioned is that the binaries finally bring support for reproducible builds by supporting the SOURCE_DATE_EPOCH environment variable. Please send bug reports, suggestions, and improvements (patches welcome!) to improve the quality of the packages. In particular, lintian complains a lot about various man page problems. If someone wants to go through all that it would help a lot. Details on request. new: acmart, chivo, coloring, dvisvgm-def, langsci, makebase, pbibtex-base, platex, ptex-base, ptex-fonts, rosario, uplatex, uptex-base, uptex-fonts. updated: achemso, acro, arabluatex, arydshln, asymptote, babel-french, biblatex-ieee, bidi, bookcover, booktabs, bxjscls, chemformula, chemmacros, cslatex, csplain, cstex, dtk, dvips, epspdf, fibeamer, footnotehyper, glossaries, glossaries-extra, gobble, graphics, gregoriotex, hyperref, hyperxmp, jadetex, jslectureplanner, koma-script, kpathsea, latex-bin, latexmk, lollipop, luaotfload, luatex, luatexja, luatexko, mathastext, mcf2graph, mex, microtype, msu-thesis, m-tx, oberdiek, pdftex, pdfx, pgf, pgfplots, platex, pmx, pst-cie, pst-func, pst-ovl, pst-plot, ptex, ptex-fonts, reledmac, shdoc, substances, tasks, tetex, tools, uantwerpendocs, ucharclasses, uplatex, uptex, uptex-fonts, velthuis, xassoccnt, xcolor, xepersian, xetex, xgreek, xmltex. Been working with a couple XeLaTeX files for a day and everything just works, usually upgrading means alot of minor tweaking here and there. Perhaps there haven’t been any major (API breaking) upgrades of the packages I use. Life is good. you’re welcome. XeTeX hasn’t seen any incompatible changes, so it is expected that your xelatex files work as normal. LuaTeX is the problem.